Just a quick watercolor illustration. 9 x 12 with copic gray tones. 11 x 17″ Commission done for Heroes con this year. Done with brush pen and copic grey markers. Pen & Ink with some watercolor and markers. Felt inspired after seeing Deadpool 2! A BIG REVEAL ON THE LAST SUNDAY IN RANDER OF FEBRUARY! 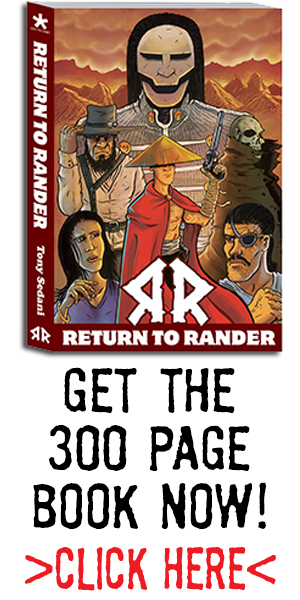 Below are the pencils and the inks of the working cover of the Return to Rander 300 page complete edition coming soon! Keep an eye peeled for lots of cool new info coming soon about the book! Welcome to a new Sunday in Rander. This week I bring to you some exciting news. In the new upcoming 300 page book will be lots of new content, and some of which will be artwork from my fellow stock*piler and lifelong friend Joel Lolar. Joel is best known for Forever Winter his ongoing comic which you can read for FREE at our online store at stockpilecomics.com! Joel will be illustrating a 5 page short story that I wrote and I couldn’t be more excited to see how it turns out. I have some preview shots of pencils on the pages to tease this bad boy up a bit. If you don’t already know, Joel is by far the best background artist I have seen. He puts in more refrence in his surroundings than most put into drawing thier pages. This brings a sense of realism to all his work because it doens’t just look accurate, it looks like you’ve been in a place like that before. It’s all in the small details. I’m sure once this gets closer to completion, I will make a new Sunday in Rander post showcasing a montage of panels to tease it.